News is breaking of a Sikh protest in Luton, apparently prompted by the release of a man accused of sexually assaulting a Sikh girl. Given that Stephen Lennon of the EDL has stated that they will be joining the protest, the assumption must be that the alleged perpetrator of the assault was from a Muslim background. Some 250 Sikhs are reported as having gathered to protest outside of Luton Police Station. One Tweet also claims that some roads in the town have also been blocked off as a consequence. According to a brief report on the East Anglia EDL Division page, the man charged with the assault is of Pakistani origin. A report on a Sikh forum claims that the girl was dragged into some woodland and raped. The BBC reports that the alleged assault took place on Monday, and that a sit-down protest is taking place outside of Luton's Buxton Road police station. Although it mentioned "members of the Sikh community", the report contained no reference to the EDL. An ITV news report noted that Sikhs had travelled to Luton from as far away as Birmingham, and that local Sikh residents were keen for the situation to be resolved peacefully and were liaising with the police to this effect, despite their initial lack of satisfaction with what they perceived to be an inadequate police response to this crime. An EDL Facebook report claims that Stephen Lennon/Tommy Robinson and Kevin Carroll visited Luton Gurdwara this evening, and that rather than numbering 250, the demonstration was some 500 strong. According to The Daily Telegraph, the protest occurred because the "community . . . feels the police could do more with regards to the investigation and current situation". Moreover, police were said to be "in talks" with protesters because of 'fears of rising tensions'. Relations between Sikhs and Muslims have often been strained, and on 18 May a group of Pakistanis attacked a young Sikh man in Heckmondwike, West Yorkshire, leaving him with a fractured eye socket and cuts and bruises. The protest was completely peaceful and concluded at 11:00pm. 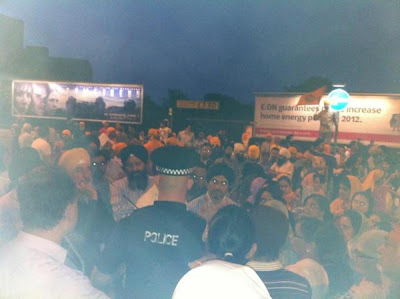 The video below is said to show Sikhs and EDL protesting together in Luton this evening. These problems need some firm will. These are inbred people (inbred by first cousins from both male and female from generations) and hate everything non-wahabi/salafi islam. If the average Brit, let alone the EDL gets it into their brain the Hindu and Sikh communities are the most law abiding and pro Uk immigrants, the UK would be better for it. Anonymous, perhaps it has escaped your erudite and in-depth knowledge of the EDL, but Guramit Singh (I'd better spell it out for you: he was a Sikh) was one of the 3 leaders of EDL for 2 years. He was forced to leave EDL not because of threats to his life (which he ignored), not because the "sikh leaders" were threatening to ex-communicate him (which he laughed off), but because of the threats to the life of his mother and other relatives. The media has chosen to ignore the support for EDL by black people, and sikhs and hindus. If you actually knew anything about EDL (other than what the media told you), you'd know that all the evidence points to people in EDL making a very clear distinction between muslims and other immigrants. Good on the sikhs protest outside like that !! I agree with the above poster, the inbreeding is a major issue as it produces a genetic sub species, many are incapable of determining what others consider right and wrong. The second problem is the Labour party continued to support not only first cousin wives/husbands, but Pakistanis (and Somalians), the greatest terrorist hotbeds in the world...well perhaps behind the UK. The marriages are often done to those from uncivilised villages, to expect those coming here (often the women have been taught to be more militant than the men) to suddenly jump three generations in terms of being civil is ludicrous. They teach their children the same bent philosophy that they are muslim therefor they are superior and have rights over the others. Stop Pakistani migration and you will see a huge reduction in crime (just look at the demographics of the Jail Population v General Population). Of course as soon as attention is paid to that, some left looney labour supporter will insist that the public is at fault and the 'disadvantaged' Pakistanis are the victims.. I am a Hindu and I support the EDL and I have many Sikh and Hindu friends that do too. Yes, the phenomenon of first-cousin marriages is particularly prevalent amongst Pakistanis resident in Bradford, with predictably negative consequences for the physical and mental health of many children produced through such unions. Your observation with respect to the statistically significant overrepresentation of Muslims in our prison population is also spot on. We gain nothing positive through the immigration of such people, or the ongoing chain migration displayed amongst these populations and justified through use of the pretext of 'family reunion'. Thilo Sarrazin: Germany’s Voice of Reason? All hail the Queen of the May!